Regulation device for pump control equipped with flow and pressure sensor connected to an electronic system. Inlet and delivery connection ports of the same diameter (G1). Built-in check valve. Pressure gauge 0-10 bar supplied as standard for all the models. Automatic reset function in IDROMAT4 for the reset of the system without manual operation. – against operation with closed connection ports. 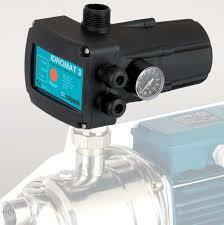 For pumps with delivery up to 10 m3 /h. Liquid temperature up to 60 °C. Mains voltage: 230 V ±10%, single-phase.